A tiny change in patch 8.1 may have escaped people’s notice: the removal of many city portals from the Shrines in the Vale of Eternal Blossoms. I wasn’t happy about this — the Shrine was a portal hotspot for anyone who played through Mists, and I used the portals in the shrine to go everywhere quickly. But whether your hearth was set to the Shrine or not, there are plenty of ways to get around the sprawling world of Azeroth. The world is packed with portals and other gadgets to shoot you from one place to another — you just have to know where to find them. If you’re a max level character, getting to major cities is simple. You can get to all of your faction’s capital cities via portals in Boralus or Dazar’alor, though not much more. There are Orgrimmar, Thunder Bluff, and Silvermoon for Horde, or Stormwind, Ironforge, and Exodar for Alliance, plus a portal to Silithus so you can make a quick run to turn in quests to Magni. 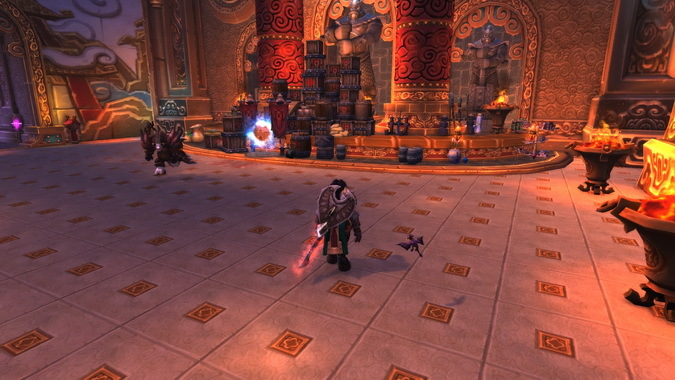 Not only is new Dalaran packed with portals, but as long as your character has started Legion content, you have a hearthstone that will take you directly there. You’ll find city portals to each major city your faction’s enclave, which includes a couple of portals you won’t see in Battle for Azeroth cities. There’s a portal to Vale of Eternal Blossoms in Pandaria, so you can head over to the Isle of Giants and be unsuccessful at obtaining the mount which drops off Oondasta (not that I’m bitter about that). There are also portals to Undercity (for Horde) or Teldrassil (for Alliance) — they won’t take you into the heart of these former cities, but land you just on the edge of the devastation. It’s a fast way to the new Darkshore World Quests for Alliance players. There are even more portals portals in the bottom of the Chamber of the Guardians in the center city. I forget about those portals a lot, but they will get you to a wide variety of locations. There’s a portal to the Caverns of Time, Shattrath, Wrymrest Temple, Karazhan, and Dalaran Crater — just be sure you have something to save you from the fall if you’re heading to the crater. 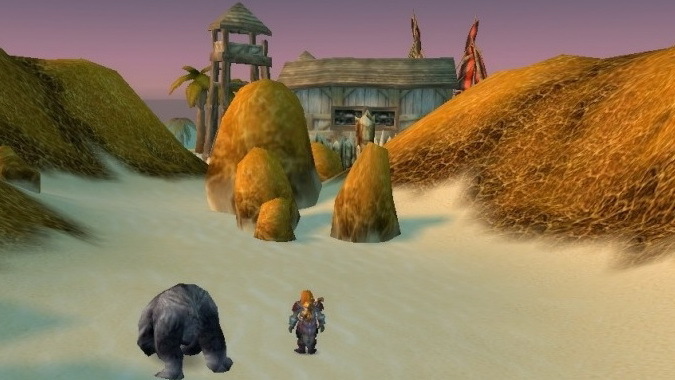 You should still have a Garrison hearthstone which takes you to Draenor, unless you decided you’d never go back there again and destroyed it. 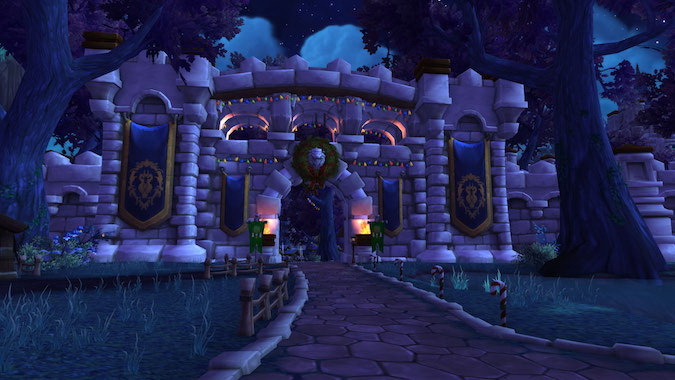 You can portal from your Garrison to your faction’s city hub in Ashran, which has portals to major faction cities. There are Orgrimmar, Thunder Bluff, and Undercity for Horde, or Stormwind, Ironforge, and Teldrassil for Alliance — and like the portals in Dalaran, the Undercity and Teldrassil portals leave you just outside these former cities. You even have a second hearthstone-like item that will send you straight to your garrison shipyard, the Admiral’s Compass (though you have to complete 50 sea missions to be given this) — so most players probably have more than quick way to get to Draenor. We have quite a few other ways to get around which don’t involve portals. I’ve compiled a list for you. This isn’t exhaustive, but it should give you an idea of how many things out there can act as hearths. Cloaks of Coordination. I use this all the time. Once you’re revered with your guild, you can buy a cloak with a two-hour cooldown that sends you to your faction’s capitol. (And at friendly, you can buy a cloak with a four-hour cooldown.) You buy these from the guild vendor in any capital city — the only snag is that they’ll only be available to guilds with certain achievements, so smaller guilds may not have them. Runed Band or the Kirin Tor and Empowered Ring of the Kirin Tor. These will take you to old and new Dalaran. Pricey, they can be purchased from Harry Winston in old Dalaran and Sminx Glasseye in new Dalaran. The old Dalaran ring has an achievement for obtaining it. Blessed Medallion of Karabor. Part of a quest chain beginning with The Secret Compromised, this necklace will teleport you to the entrance to Black Temple. If you are working on Ashtongue Deathsworn rep, I recommend doing this chain. Violet Seal of the Grand Magus. Building rep in old Karazhan or trying to get the Smoldering Emberwyrm mount? You’ll need to pick up No Bones About It, kill Nightbane, loot his bones, and take them to Darius outside. He gives you this ring which acts as a teleport to Karazhan. Ruby Slippers. Speaking of Karazhan, you need to kill the Crone in the old Karazhan Opera event to get these shiny slippers. They simply act as another hearthstone. Baradin Warden’s Tabard. This takes you to Tol’Barad. It’s useful if you are going to run this battleground or if other Stormwind and Orgrimmar hearths are on cooldown as there’s a portal to those at the home base. You will need to run Tol’Barad to get this one, because the tabard is purchased with 40 commendations. Last Relic of Argus. This is one of my favorite teleportation devices because you never know where you’re going to wind up. The relic comes from Draenei archeology. Clicking on it sends you to a wide variety of places including behind the pirates in Tanaris. It’s fun to see where you wind up. From there, you can fly to wherever you need to go. Finally, referencing the Ruby Slippers mentioned above, there are other items which act like hearthstones. If it doesn’t specifically say it takes you somewhere else, something acting as a hearthstone will take you to wherever you have your hearth set. For example, The Innkeeper’s Daughter — obtained from Dwarven archeology — takes you to your primary hearth. Blizzard mentioned new portal rooms are coming in Patch 8.1.5. Stormwind and Orgrimmar will have a dedicated room for portals, with room for more in the future. The above mentioned Cloak of Coordination will definitely come in handy then.